The manager has been working in tourism for over 21 years working as dishwasher, waiter, cook, bartender, guide and front desk manager. Along with his certified training in Travel and Tourism this means he certainly knows how to run a top quality resort! He also has a passion for travel, himself traveling through 13 countries. He hopes you will enjoy your time at JAW, we want you to relax and feel at home. For your Travel Arragement, Online Booking and Bus Tickets Please contact to our Office. 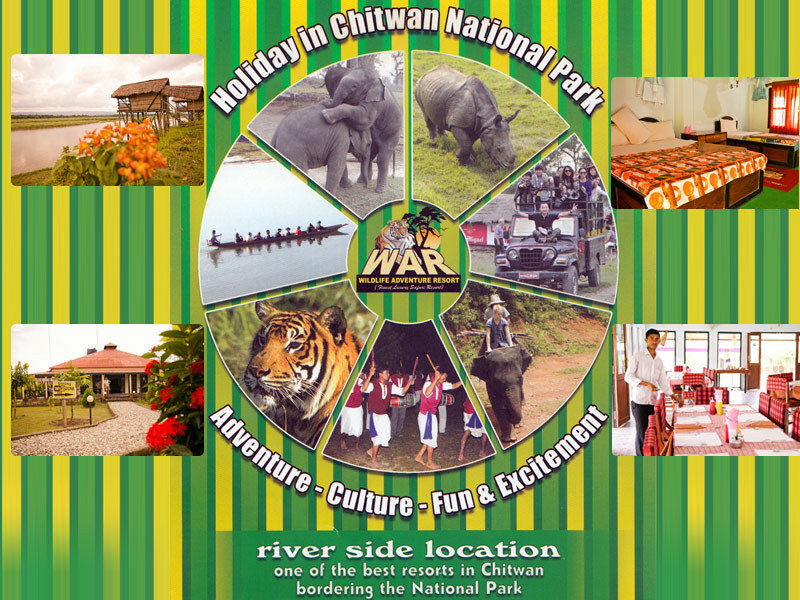 Wildlife Adventure Resort are located on the Bank of the Chitwan National Park and the Rapti River. You can view the animals crossing the river and drinking water from every rooms. Grazing deer and lying crocodile including many migrated birds from Siberia are the common views from the Balconies. The Hotel is surrounding rice fields, Cultural Tharu Village and Rapti River. You may feel really familiar and local culture environment here. We have 25 years of experience running the Resort with friendly atmosphere doing some of the social activities as helping the orphanage children and providing them education. Hotel Accommodation: We have 26 western style A/C rooms facing the Rapti River and the Chitwan National Park. Every room has two balconies on the front and back from where you can see the grazing animals and many birds on the river including the crocodiles lying on the river bank. We have a big-wide opened dining hall with the capacity of 60 people at a time surrounded by the terrace. We provide all kind of food that you prefer including Indian, Nepalese, Chinese and Continental. Our bar is the unique than others as it lies on the edge of the River and the National Park. While drinking, you feel that you are personally in the jungle or among the wild animals.